My mission in Zambia turned out to be nothing like I expected. Before I left, I had spent a lot of time researching the country, learning about the current status of abject poverty and HIV/AIDS in the region, deciding on the best regime for malaria prevention, even carefully choosing the items that I would pack in my suitcase. I thought I knew what I was getting in to, and I truly believed that I was going to make a difference in the lives of the people I was there to serve. My ministry site was an orphanage for young children, and I was put in charge of fifteen 2-3 year olds. All it took was one botched attempt to change a cloth diaper to help me realize that I still had so much to learn. Thankfully, I was surrounded by a welcoming community of fellow caregivers who not only helped me clean up the mess, but also patiently re-explained the correct folds and pin placement. I had many moments like this – where I found myself overestimating my own aptitude and in need of help from the very people I was there to serve. This was a big lesson in humility for me. I began to spend more and more time in prayer – asking God to help me understand why I was called to a job I felt so under-qualified for – and I started to see that it was my pride that kept getting in the way. Only when I learned to slow down and trust that it was not about my own abilities, but rather my openness to God working through me and through those around me, that my mission began to have meaning. 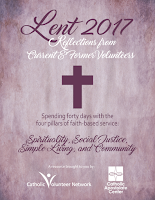 I think that the Lenten journey is a bit like the experience of starting a volunteer program. You enter the season with lofty aspirations and good intentions. You know there will be some sacrifices involved, but you trust that God is going to show up in your life and that will bring meaning to your work. Daily prayer and reflection can help you become more aware of the presence of the Divine surrounding you every day. Take these next forty days to hear how God is speaking to you in unexpected ways. 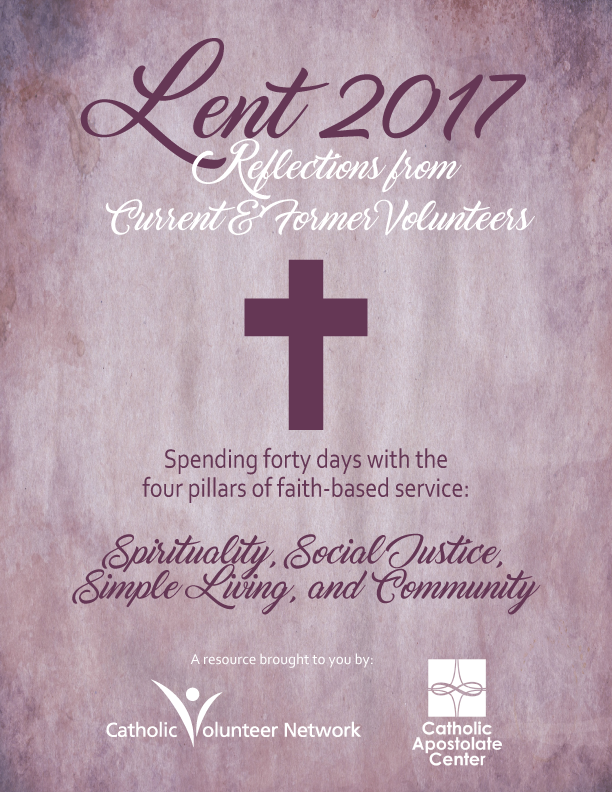 Catholic Volunteer Network, in partnership with the Catholic Apostolate Center, welcome you to journey with us through this season of Lent. We have put together a collection of reflections written by current and former volunteers to help you draw close to the experience of service rooted in faith during this important liturgical season. Download the 2017 Reflection Guide here. Simplicity: Many volunteers receive a small monthly stipend to cover their expenses, but living simply is not only about spending as little money as possible, it is an intentional choice to focus on relationships rather than material goods, and to learn to be better stewards of the gifts that God has given us to enjoy. Social Justice: As volunteers work alongside people experiencing some of the most dire forms of poverty, they challenge themselves to learn more about the underlying structural and social factors. For many programs, Catholic Social Teaching is the foundation of their understanding of social justice. Community: Our volunteers do not take on this work alone, they live in intentional communities where they share meals, household chores, and learn to make decisions together. This daily presence in one another’s lives is a source of support, accountability, and friendship for volunteers. Spirituality: For many volunteers, their time of service is also a time of profound spiritual growth. Many programs facilitate regular community spirituality nights, host several retreats throughout the year, and encourage volunteers to seek out a spiritual director.Volunteers often find that their faith comes alive while they are living out these four pillars and engaging in volunteer service. We are thankful for the opportunity to accompany you during this holy time. May God speak to you through these reflections over the next forty days! About the Author: After graduating from the University of Dayton, Katie Mulembe journeyed to Zambia, Africa, where she served as a missioner with the Franciscan Mission Service for three years. Soon after completing her mission work in 2007, Katie was drawn to the mission of Catholic Volunteer Network and joined the team. She now serves as the Director of Operations.